FeuerThoughts: A sign of the times, or just of Orlando? I just came back from a couple of days in Orlando, Florida. Gave a talk at the Central Florida Oracle User Group and then a full day training for almost 40 Oracle technologists at the Doubletree Club hotel in Lake Buena Vista (right next to the entrance to Disney World). And since it is wintertime and very cold in Chicago, my wife Veva actually agreed to accompany me, in search of sun and warmth. How nice! Now, I must admit: I find it hard to visit Orlando, at least the Disney World zone, which is where I almost always end up (Oracle conferences and so on). It is such an relentlessly fabricated pseudo-reality. It is bad enough that most of America seems to be paved over with malls, fast food "restaurants" and chain stores - it all looks enough. In Orlando, that homogeneity is celebrated with bigger versions of the Sameness, as if everything has been supersized and plasticized. Through the Internet, I reserved a room at the Sherato Vistana, which seemed like a really nice resort hotel. I guess it was, but when we arrived, we were thoroughly alienated by its sprawl. Hey, plus there wasn't even Internet access in the room. Had to visit the (I kid you not) cyber.internet.cafe (really cool name). Anyway, we stayed there one night and then escaped to an almost-normal hotel, the Doubletree Club, where I gave my training. On the day before the training the skies were overcast and the temperature was only in the 60s. Not poolside weather. But we adjusted our expectations and, determined to enjoy the outdoors (still much better than the 20 degrees in Chicago), we headed to the Leu Gardens. This is a beautiful nature preserve near downtown Orlando that is filled with enormous Southern Live Oaks covered with Spanish moss, hundreds of Camelia bushes, and much much more. We walked around it for a couple of hours, enjoying the sounds of the bamboo scraping in the wind, the smell of the tropical flowers, and the wonderful colors of the butterfly garden. I encourage everyone visiting the Orlando area to take time away from Wet N Wild, Universal Gardens, Disney World, etc., to visit the Leu Gardens. Now, as to the "sign of the times", we got back late one evening to the Doubletree Club and the parking lot was quite full. 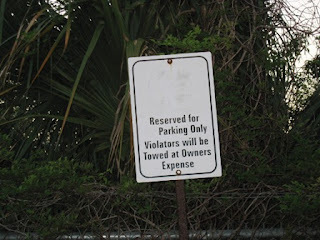 So we drove all the way to the back and a s we parked in an empty spot, we noticed the sign to the right. It says "Reserved for Parking Only." Which immediately begs the question: what exactly are they worried people might do in these parking spots besides park? Hold a seance? Swear in the next Supreme Court Justice? Well....we were in any case careful to do nothing more than park there. I'd say there's got to be a word missing from that sign judging by the word alignment. Must be something short. My guess is "VIP", in which case of course you were perfectly entitled to park there! Your introduction hit me straight on when you discuss the world you are living in (malls and supersizing and so on). I suggest you relocate to Europe immediately, that's where you would fit in great! At the same time us Europeans (Im in the Netherlands) could benefit more from your talks and trainings!! !